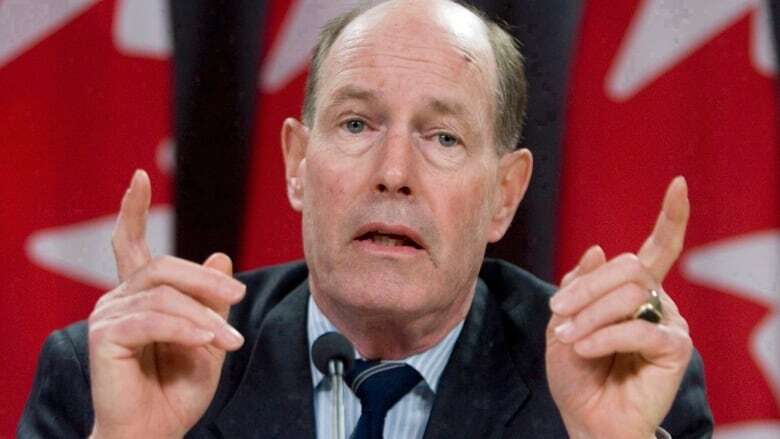 Former Bank of Canada governor David Dodge is taking issue with the notion that balancing government budgets as quickly as possible is the key to a strong economy, or that it is a wise policy at the moment. In a new paper for the Bennett Jones legal firm, where he is now a senior adviser, Dodge analyses the two-speed Canadian economy and has some advice for governments to improve competitiveness and growth. Without naming any specific governments or politicians, Dodge makes clear that he believes now is not the time to slash and burn to get to a balanced budget. Instead, the emphasis should be on taking advantage of low interest rates to invest in infrastructure to help improve Canada's lagging productivity, which he says is holding back the economy. The aim should not be to get deficits to zero as quickly as possible, but to reduce deficits to below nominal growth in the economy so that deficits become an ever-decreasing share of gross domestic product, he says. "It is thus important to realize that in the current environment of low long-term interest rates, fiscal prudence does not require bringing the annual budget balance to zero almost immediately. Small increases in borrowing requirements to finance infrastructure investment would still lead to declines in the debt-to-GDP ratio," he writes. "Governments should expand their investment in infrastructure while restraining growth in their operating expenditures so as to gradually reduce their public debt-to-GDP ratio." The advice from one of Canada's most respected central bankers — he headed the institution between 2001 and 2008 during one of the country's most expansive economic periods — comes at a time when the issue of fiscal policy is front and centre in political discussion. On Monday, federal Finance Minister Joe Oliver chided both Ontario and Quebec for failing to corral their deficits, tying fiscal policy in Canada's two largest provinces to weak economic performance. The Harper government also has taken pot shots at Liberal Leader Justin Trudeau's less aggressive stance on deficit elimination. Trudeau has suggested the budget will return to balance through economic growth, without the need for aggressive austerity measures. As well, Ontario Conservative leader Tim Hudak has made fiscal prudence the central plank in his campaign, promising to eliminate 100,000 public service jobs if elected on Thursday. By Dodge's analysis, which he co-wrote with Bennett Jones advisers Richard Dion and John Weekes, one of the chief problems with the Ontario and Quebec economies is loss of competitiveness since 2003 as higher commodity prices, particularly for Alberta oil, pushed up the dollar at the expense of central Canada's manufacturing sector. From 2008 to 2012, he says, Canada benefited from favourable terms of trade due to elevated commodity prices, but the spoils were not evenly spread. "At the same time as they were buttressing real national income and domestic spending, the high commodity prices and terms of trade contributed to keep the Canadian dollar strong, thereby holding down real net exports," Dodge said. "The resulting negative impact on real GDP would have varied considerably across provinces ... Ontario likely experienced relatively more severe losses of output than other regions of Canada as a direct result of losses in exports." As well, Dodge says although commodity sales were a net gain for Canada, the gain was "highly concentrated in commodity-producing Western Canada and Newfoundland and Labrador." "The net impact of the terms of trade on real domestic income, on the other hand, we estimate to have been positive for most provinces but not for Ontario." In another recommendation, Dodge warns against Canadian regulators falling too closely in line with global financial system reforms being implemented as a result of the meltdown in 2008 that triggered the worldwide recession. While he agrees with forcing banks to retain more capital to backstop their operations, the move to "deadweight" regulations that add to compliance costs is lessening Canada's advantage in the sector, he says. "While Canada still has a fairly efficient financial system relative to other advanced economies, our advantage is declining," he cautions. "Canadian authorities should resist pressure from the Basel Committee and the Financial Stability Board to replace our highly successful pre-2008 supervisory process with costly detailed 'black letter' regulation, regulation which is often not even appropriate for Canada." In the report, Bennett Jones forecasts Canada's economy will grow by 2.2 per cent this year and 2.4 per cent in 2015. David Dodge will be a guest on CBC's The Lang & O'Leary Exchange on Thursday.